Villanova's chances of an NCAA cross country championship three-peat in 2011 have been put in jeopardy not so much because of anything that has developed (or failed to develop) during this cross country season. The real reason coach Gina Procaccio is searching for a way to patch up the back end of Villanova's talented but thin 2011 squad is something that happened in December 2009. That's the month -- on the heels of Villanova's 2009 cross country title -- that talented freshman Brooke Simpson, suffering from a severe bout of homesickness, decided to leave Villanova and return to her native Gymea Bay in New South Wales, Australia. Even as a freshman in her first semester in the States, Simpson was a key contributor for that 2009 national championship team. After two races as Villanova's 7th finisher, she rose to the challenge in the important late-season meets to help propel Villanova to a national crown. She was 11th overall (Villanova's #4) at the 2009 Big East championships, was 15th overall (Villanova's #7) at the NCAA Mid-Atlantic regional, and a strong 51st overall (Villanova's #6) at the NCAA National Championship race in Terre Haute. Even though she did not score for Villanova in the two NCAA races, her stellar finishes in 15th and 51st places, respectively, displaced scoring runners for Villanova's competitors, further separating Villanova from its challengers. Her All Big East and All Mid-Atlantic Regional performances gave Gina Procaccio a rising talent in that class slot, looking toward the future. All looked in place for an extended run at national titles: Simpson was a freshman, Reid and Mimic were sophomores, Marino and Smith were juniors, and Schappert and Tallman were seniors. When Simpson decided to return home, suddenly the Villanova women had a problem: how would that freshman slot be filled as 2009 turned to 2010, 2011, and 2012? It is that vacancy in Villanova's top 7 that is currently staring Gina Procaccio in the face. Villanova was able to recruit high school phenom Emily Lipari to the squad in 2010. Because Simpson was gone, Procaccio was forced to place an unreasonable burden on a true freshman (and one who was primarily noted as a miler): fill the slot as the team's #5 scorer and finish early enough in the chute to give the team a shot at another national title. Lipari was one of the heroes of the 2010 team because she was able to come through despite the immense pressure placed on her individual performances. Had Simpson been on the 2010 team as a sophomore, Lipari's transition to collegiate running would have been more normal, probably as Villanova's #6 runner. She was not afforded that luxury. In the end, Procaccio pulled off something of a miracle: she filled the Simpson vacancy with a true freshman running beyond her optimal distance and with the fate of the team result resting on her shoulders. Unfortunately, while in 2010 Villanova had lost only one of its top 5 scorers from 2009 (Nicole Schappert) and was able to fill that slot in 2010 with Lipari, the transition from 2010 to 2011 saw two scorers graduate: All-Americans Amanda Marino and Ali Smith. With only three of its top 5 scorers returning for 2011, and without what would have been a top 3 or 4 scorer in Simpson, the Villanova women found their quest for a third consecutive national title in serious jeopardy. Finding a solution to the absence of Brooke Simpson was now a much bigger problem. Unable to land high school All-American Aisling Cuffe in the recruting wars, Villanova's #4 and #5 scorers would have to emerge from the returning runners already on the team. The 2011 burden has, as a result, fallen onto the shoulders of sophomore Nicky Akande and senior Callie Hogan. It is they who have been asked this year to play the role of 2010's Emily Lipari. If Procaccio's 2010 margin of error was wafer thin, it has become razor thin in 2011. While it ultimately proved surmountable in 2010, the jury is still out for 2011. Villanova's top three runners are the best in the country. Its top four runners on any given day can beat any other foursome in the country. 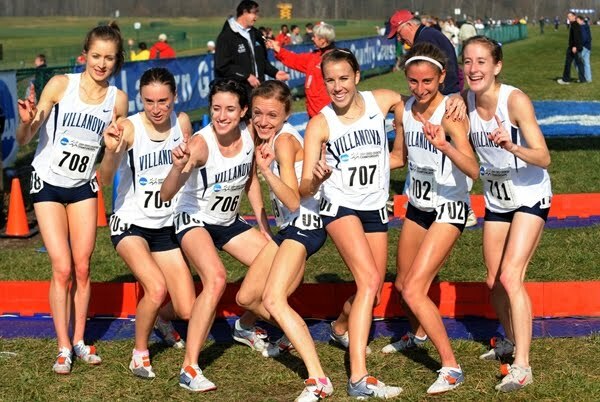 Cross country, however, is a five-runner sport and -- absent Brooke Simpson -- it's not clear if Villanova can catch lightning in a bottle again in 2011. And home-sickness is nothing that a cross country coach can control.